In anticipation of the forthcoming flood of electric vehicles, the City of New York just officially unveiled its first EV charging station. 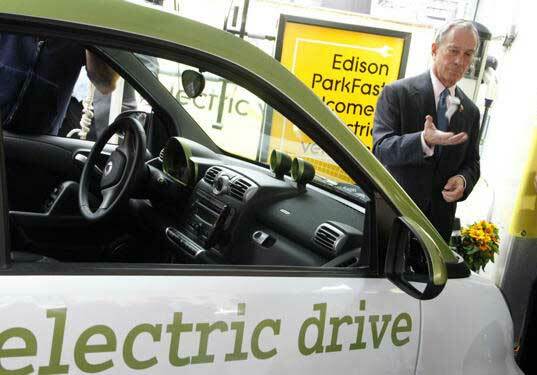 The station is the first of 100 that will be installed in the New York City metro area this year to get the region ready for the release of EVs later this year — like the Nissan Leaf and the Chevy Volt. When those vehicles hit the streets of NYC, an infrastructure of charging stations will be awaiting them, thanks to a federally-sponsored program called ChargePoint America. ChargePoint America is a program supported by Coulomb Technologies that aims “to provide electric vehicle charging infrastructure to nine selected regions in the United States.” The regions include NYC, San Jose, San Francisco, Sacramento, Austin, Los Angeles, Washington D.C., Detroit, Orlando and Bellevue-Redmond in Washington State. The program will provide the infrastructure for these nine regions to be EV ready by the time the first crop of vehicles hits the road this coming fall. It also provides maps and driving directions for EV owners so they can be informed on where to charge up. ChargePoint America hopes to have 4,600 charging stations around the US by October of 2011, but for now they’re just getting started — and we’re excited about their first leaps! The City of New York plans to buy at least 40 electric vehicles for city purposes this year, and we’re sure to see city workers charging up at the many stations around the metro area. The first is in Manhattan on Edison Properties parking facility on Ninth Avenue between 35th and 36th Streets. It’s expected that EV manufacturers will be concentrating sales in EV-ready cities. Look out New York residents! You’re looking at cleaner cars in the near future! You've hit the ball out the park! Incdreblie! In anticipation of the forthcoming flood of electric vehicles, the City of New York just officially unveiled its first EV charging station. 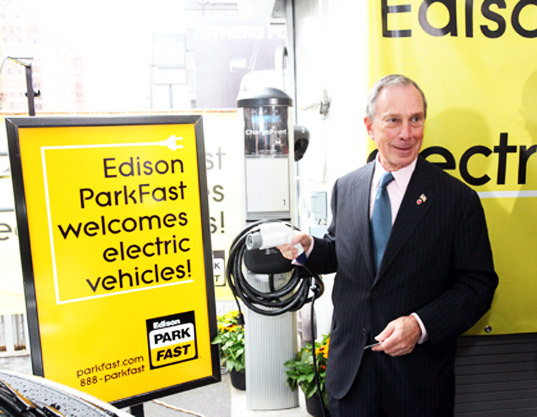 The station is the first of 100 that will be installed in the New York City metro area this year to get the region ready for the release of EVs later this year -- like the Nissan Leaf and the Chevy Volt. When those vehicles hit the streets of NYC, an infrastructure of charging stations will be awaiting them, thanks to a federally-sponsored program called ChargePoint America.